DNA serves as the genetic material of most organisms, storing information for the growth, development and reproduction. The complete set of DNA of an organism is referred to as the genome. The genomes of organisms are dynamic entities that change over time. 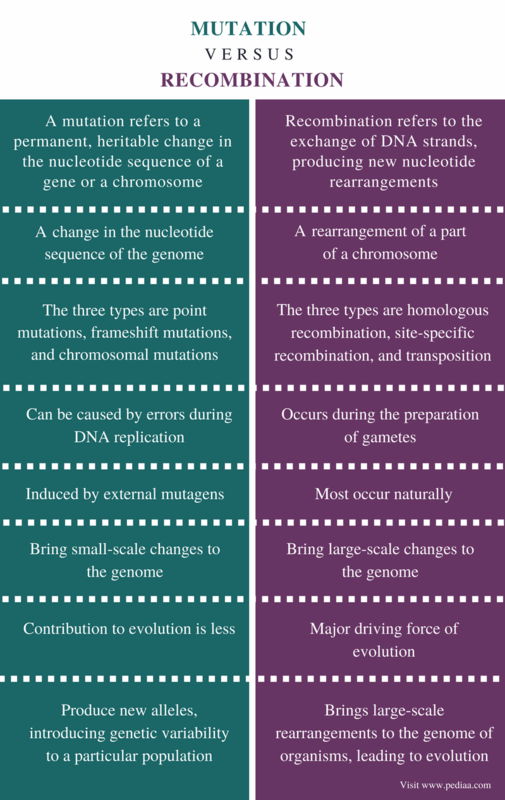 Mutation and recombination are two types of changes that can occur in the genomes. A mutation refers to a change in the nucleotide sequence of a short region of DNA. On the other hand, recombination reconstructs a part of the genome. The main difference between mutation and recombination is that mutation brings a small-scale rearrangement in the genome whereas recombination brings a large-scale rearrangement in the genome. A mutation refers to a permanent, heritable change in the nucleotide sequence of a gene or a chromosome. It can arise due to errors during DNA replication or damaging effect of mutagens such as radiation and chemicals. A mutation can be a point mutation, which replaces a single nucleotide with another, a frameshift mutation, which inserts or deletes one or a few nucleotides, or a chromosomal mutation, which alters the chromosomal segments. 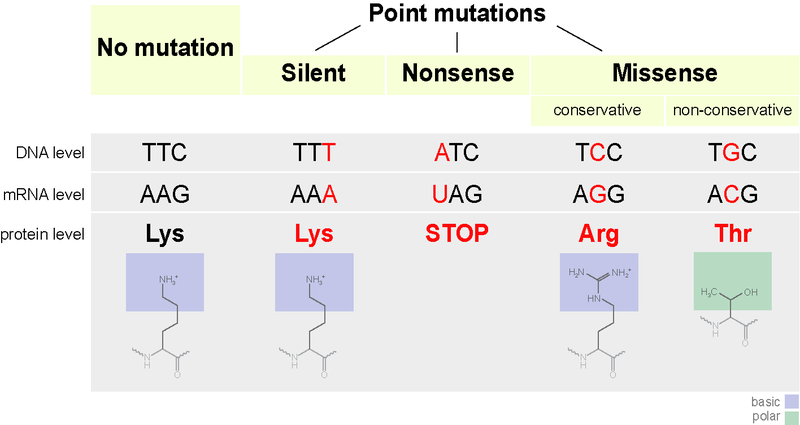 Point mutations are also known as substitutions as they replace nucleotides. Three types of point mutations can be identified based on the effect of each type of mutations. They are missense mutations, nonsense mutations, and silent mutations. In missense mutations, the alteration of a single base pair in the nucleotide sequence of a gene may alter a single amino acid, which may ultimately result in producing a different protein, instead of the expected protein. In nonsense mutations, the alteration of a single base pair in the nucleotide sequence of a gene may serve as a signal to inhibit the ongoing translation. This may result in the production of a non-functional protein, consisting of a shortened amino acid sequence. 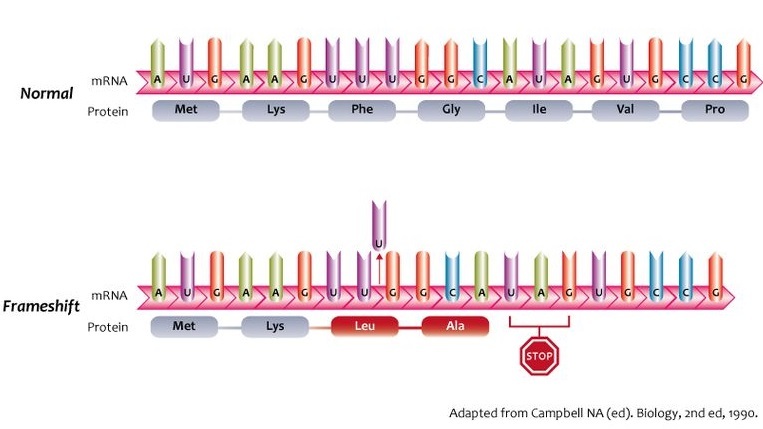 In silent mutations, the change may code either for the same amino acid due to the degeneracy of the genetic code or a second amino acid with similar properties. Therefore, the function of the protein may not alter through the nucleotide sequence varies. Different types of point mutations are shown in figure 1. The three types of frameshift mutations are insertion, deletion, and duplication. An insertion of a single or a few nucleotides will change the number of base pairs of a gene. Deletion is the removal of a single or a few nucleotides from a gene. In duplications, one or few nucleotides are copied once or several times. So, all the frameshift mutations alter the open reading frame of a gene, introducing changes to the regular amino acid sequence of a protein. The effect of a frameshift mutation is shown in figure 2. 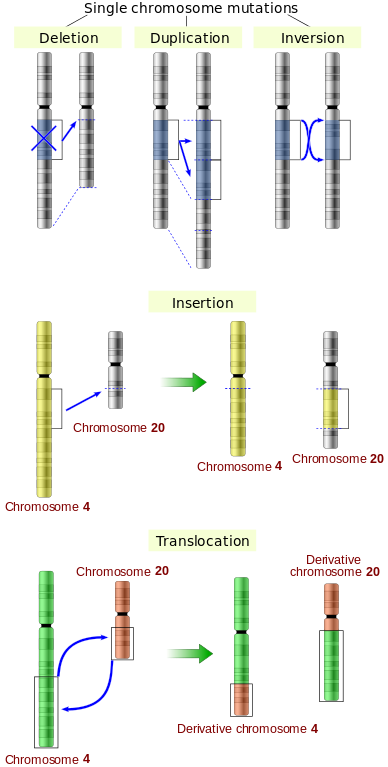 The types of alterations in chromosomal segments are translocations, gene duplications, intra-chromosomal deletions, inversions, and loss of heterozygosity. Translocations are the interchanges of the genetic parts of nonhomologous chromosomes. In gene duplication, multiple copies of a particular allele can occur, increasing the gene dosage. Intra-chromosomal deletions are the removals of segments of chromosomes. Inversions change the orientation of a chromosome segment. Heterozygosity of a gene can be lost due to the loss of an allele in one chromosome by deletion or genetic recombination. The chromosomal mutations are shown in figure 3. The number of mutations in the genome can be minimized by DNA-Repair mechanisms. DNA repair can occur in two ways as pre-replicative and post-replicative. In pre-replicative DNA-repair, the nucleotide sequences are searched for errors and are repaired prior to DNA replication. In post-replicative DNA-repair, the newly-synthesized DNA is searched for errors. Recombination refers to the exchange of DNA strands, producing new nucleotide rearrangements. It occurs between regions with similar nucleotide sequences by breaking and rejoining DNA segments. Recombination is a natural process regulated by various enzymes and proteins. Genetic recombination is important in maintaining genetic integrity and generating genetic diversity. The three types of recombination are homologous recombination, site-specific recombination, and transposition. 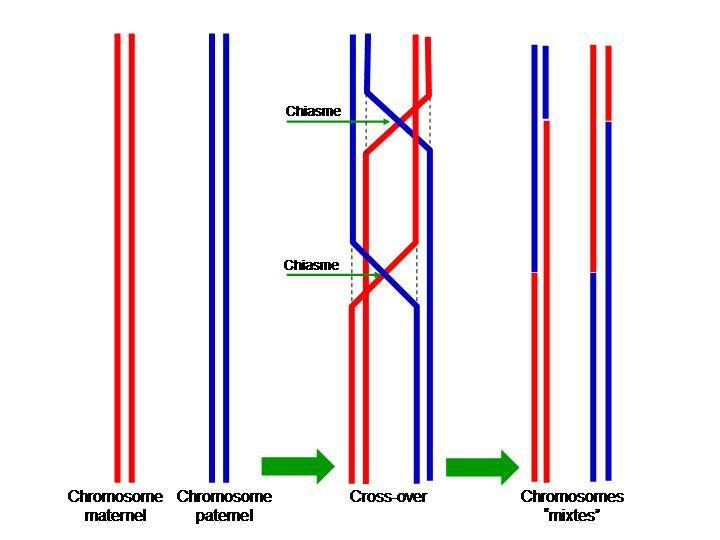 Both site-specific recombination and transposition can be considered as non-chromosomal recombination where no exchange of DNA sequences occurs. Homologous recombination is responsible for the meiotic crossing-over as well as the integration of transferred DNA into yeast and bacterial genomes. It is described by the Holliday model. It occurs between identical or nearly identical sequences of two different DNA molecules that can share homology in a limited region. The homologous recombination during meiosis is shown in figure 4. The site-specific recombination occurs between DNA molecules with very short homologous sequences. It is involved in the integration of the DNA of the bacteriophage λ (λ DNA) during its infection cycle into the E. coli genome. Transposition is a process used by recombination to transfer DNA segments between genomes. During transposition, the transposons or the mobile DNA elements are flanked by a pair of short direct repeats, facilitating the integration into the second genome through recombination. Recombinases are the class of enzymes which catalyze the genetic recombination. The recombinase, RecA is found in E. coli. In bacteria, recombination occurs through mitosis and the transfer of genetic material between their organisms. In archaea, RadA is found as the recombinase enzyme, which is an ortholog of RecA. In yeast, RAD51 is found as a recombinase and DMC1 is found as a specific meiotic recombinase. Both mutation and recombination produce rearrangements in the genome of a particular organism. Both mutation and recombination help to maintain the dynamic nature of a genome. Both mutation and recombination may produce alterations in the regular functioning and characteristics of an organism. Both mutation and recombination produce genetic variability within a population. Both mutation and recombination lead to evolution as they bring changes to organisms. Mutation: A mutation refers to a permanent, heritable change in the nucleotide sequence of a gene or a chromosome. Recombination: Recombination refers to the exchange of DNA strands, producing new nucleotide rearrangements. Mutation: Mutation is a change in the nucleotide sequence of the genome. Recombination: Recombination is a rearrangement of a part of a chromosome. Mutation: The three types of mutations are point mutations, frameshift mutations, and chromosomal mutations. Recombination: The three types of recombination are homologous recombination, site-specific recombination, and transposition. Mutation: A mutation can be caused by errors during DNA replication. Recombination: Recombination occurs during the preparation of gametes. Mutation: Mutations can be induced by external mutagens. Recombination: Most recombinations occur naturally. Mutation: Mutations bring small-scale changes to the genome. Recombination: Recombination brings large-scale changes to the genome. Mutation: The contribution of mutations to evolution is less. Recombination: Recombination is the major driving force of evolution. Mutation: Mutations produce new alleles, introducing genetic variability to a particular population. Recombination: Recombination brings large-scale rearrangements to the genome of organisms, leading to evolution. Mutation and recombination are two mechanisms that alter the DNA sequence of a genome. Mutation is an alteration in a nucleotide sequence while recombination alters a large region of the genome. Since the effect of recombination on a genome is higher than that of the mutation, the recombination is considered as the major driving force of evolution. The main difference between mutation and recombination is the effect of each mechanism on the nucleotide sequence of the genome. 1. Brown, Terence A. “Mutation, Repair and Recombination.” Genomes. 2nd edition., U.S. National Library of Medicine, 1 Jan. 1970, Available here.